SCC Marketing Ltd. celebrated the twenty-fifth work anniversary of Ian Batty, Warehouse Manager, at a surprise presentation lunch on the 17th May 2016 attended by staff from all divisions. It was tricky getting everyone together without tipping Ian off, but I think we managed it! Ian has demonstrated consistent dedication to the various roles he has performed within SCC Marketing Ltd. over the last 25 years and he has contributed to the successful development of the company through many changes over that time. 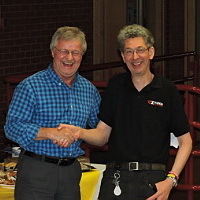 Joe Stewart, Managing Director, presented Ian with with a Digital SLR camera and camera equipment on behalf of the company and staff, as a token of our gratitude. Ian is a valued member of our team and we look forward to many more years working together. Ford Europe launched Xvision in Quarter 2 of 2014 - now one of Europe's best selling products. Ford Europe launched the Xvision Parking System in Quarter 2 of 2014 and by the end of the year it had become one of Europes best selling aftermarket products. Xvision has been available in UK Ford dealers for almost 10 years, becoming the UKs best selling aftermarket parking sensor system. Xvision provides dealers with market leading support and training, ensuring that the customer experience is first class, and this may explain the UK success. This level of service and support are now available to Ford dealers in Europe, where, in just 7 months, Xvision quickly began outselling the competition. With continued growth expected throughout 2015 as Xvision is adopted by more European dealers, Xvision is quickly cementing its place as Europes favourite too. 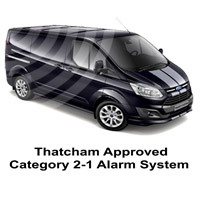 Ford has added the Thatcham 2-1 Approved Xvision Alarm to their list of products approved for fitting to commercial vehicles pre-registration. Xvision is the only alarm to make the list! One feature of the alarm is that it also includes a tilt sensor, offering real security to vehicles. To many, the name Thatcham and security are synonymous. Their advice and on-going work to improve vehicle security and reduce theft now provide the industry with a trusted standard. To be Thatcham Approved is now required by most insurance companies. Add to that Ford’s seal of approval, making Xvision the only aftermarket alarm endorsed for Ford vehicles, whether you have a Fiesta or a Transit Van, and you know that this is an alarm system you can trust.